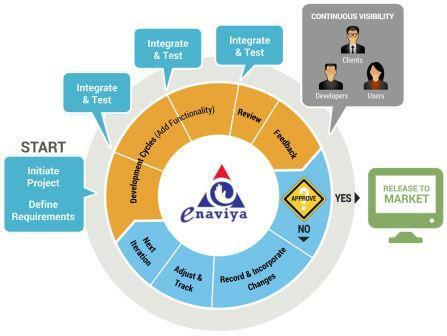 For years, Enaviya has strived to be and has succeeded in being a client-centric organisation. We are a dedicated team of professionals who have made it our goal to serve you better in software & application development. For us, presenting you with software development solutions and services you require for a profitable business and some more is not just a directive; it's how we do business. To equip ourselves better in order to handle your requirements more efficiently, we have identified a few centers of excellence and set up knowledge banks to gain exhaustive familiarity with various fields of technology we will need. Enaviya's Centers of Excellence (CoE) is constantly tracking the technological advancements in the relevant fields and also following the developments and trends in the global market closely so that we are always ahead in the IT world. We aim at infusing our knowledge into your sphere of industry not only to provide you with IT solutions, but also to expand our knowledge base in order to drive strategic alliance. Enaviya believes in reduced time delivery of solutions. To fulfil this, we design, develop and maintain all our services such that the components, methodologies, techniques and frameworks can be re-used for faster and high quality services. We focus on control libraries, engineering tools and reusable software components to bring high-quality software applications to market faster and smarter.